You’ll need a reference from your boss to hand to your new employer. Word of negative attitudes can spread, especially in fields where people are well-networked. You could find yourself working at the company again if better opportunities arise or a counter-offer is made. So what should you exclude from your resignation letter to avoid burning bridges? Important: always keep your letter of resignation professional. The easiest way to answer that question is to consider the tone. Like any other employment document on file with your current company (cover letters, resumes, thank-you letters, etc. ), the language should always reflect professionalism. Moreover, your tone should be positive. For a smooth departure free of negative fallout, avoid the following when writing a resignation letter. It’s tempting to give a long list of reasons you became disgruntled with your current job. However, a resignation letter is not the vehicle for doing this. You can speak with someone face-to-face and reveal frustrations during your exit interview. Don’t project bitterness; it suggests you enjoy holding grudges. Mention positive aspects of your current job and what you learned – even if you have to be vague. When your boss knows you had problems in your job, but you don’t raise them in your letter, you’ll earn respect through your professional approach. Your resignation letter is not the right place to get personal about others, no matter how incompetent they were. Remember, your letter will probably be kept on file even if your current boss leaves. If you come back someday, you don't want your written words to show you in a bad light. Leave other people out. A letter of resignation focuses on you, not your colleagues. Their behavior may have played a part in your decision to leave, but playing the blame game makes you look like a weak team player. That means no obscenities or put-downs of any kind. Language deemed inappropriate for a workplace conversation must be kept out of a resignation letter. It seems obvious, but you'll be surprised at the language people include when emotions are running high. Finally, bear in mind your letter is going into your employment file. So future employers could read it. Don’t jeopardize opportunities through an offensive document on record. This doesn't concern your current employer. You don't have to mention which company you're joining, and you certainly don't have to mention your new salary or benefits package. The letter should be brief and to the point, so these are unnecessary details. It should only state when you are leaving and acknowledge the part your current job played in your career advancement. If you’re leaving despite a good working relationship with your boss and colleagues, don’t get over-emotional in your letter. Save personal sentiments about your work experience with colleagues and mentors for a face-to-face chat. Again, it comes down to a professional outlook to keeping your records free from anything that raises eyebrows. Threats are an absolute no-no. Yes, negative actions by others can force resignations. And perhaps those actions had far-reaching effects on your career or reputation. But hinting at revenge will cause more harm than good. If you don’t control your emotions, and you go all-out with your threats, you could find yourself in serious trouble. That’s one black mark on your career that can take years to erase. An error-filled letter goes to prove you’ve lost motivation and your departure is the right decision. A short, amicable resignation letter leaves little chance of grammar and spelling errors. Resignations are part of everyone’s career, and you may go through several during your professional life. The rule of thumb when writing a resignation letter is be professional. Remember, what you write, and your attitude during the process can affect future job prospects. 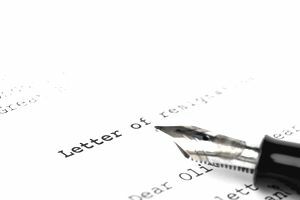 If you need to write a good letter, check out these resignation letter templates. They’ll help you craft a suitable letter that protects your name and reputation as you take the next steps on your career path.